The results of US presidential elections have large effects on public health by their influence on health policy, the economy, and diverse political decisions. We hypothesized that mobilizing approximately 50% to 55% of the population, along with US reliance on motor vehicle travel, might result in an increased number of fatal motor vehicle crashes during US presidential elections… We analyzed national data from the Fatality Analysis Reporting System of fatal crashes in the United States from 1975 to 2006. We included all presidential elections since database inception (from Jimmy Carter in 1976 through George W. Bush in 2004) during the hours of polling (defined as 8:00AM to 7:59 PM local time). For each election, we also identified the same hours on the Tuesdays immediately before and immediately after as control days for the number of individuals in fatal crashes at the time, as described previously. Confidence intervals (CIs) for comparing death counts on election days and control days were calculated by binomial tests. This yielded a relative risk of 1.18 on election days (95% CI, 1.10-1.26; P < .001), equivalent to an absolute increase of 189 individuals over the study interval (95% CI, 104-280). The net increase in risk was about 24 individuals per election and was fairly stable across decades of time (see Figure below). The increase in relative risk extended to pedestrians and persisted across different ages, sexes, locations, polling hours, and whether a Democrat or Republican was elected. No difference in risk was observed in separate sensitivity analyses of individuals involved in fatal crashes during the same hours comparing the Monday before the election with control Mondays (relative risk, 0.97, 95% CI, 0.89-1.06) or comparing the Wednesday after the election with control Wednesdays (relative risk, 1.03; 95% CI, 0.95-1.12). Data are counts of individuals in the crashes (in which not all persons necessarily died) during polling hours (8:00 AM to 7:59 PM, except where noted with alternative hours). Because 2 control days are available for each election day, expected deaths were calculated as total control deaths divided by 2. CI indicates confidence interval. Many critics of Nate Silver and other modelers have popped up out of the woodworks lately. I’m sure small improvements can be made to his models and to others. But at the end of the day, I prefer math models to educated guesses. All models are an abstraction of reality. They may still be useful (and I believe that many of the forecasting models are–our world runs on models). But let’s be clear: all rely on proxies and/or data that is available. Both proxies and data introduce sources of errors into the predictions. Now that we’re getting closer to the election, many models use state polls for forecasts. Now, the national polls are no longer relevant because the election hinges on a few, key states. This implies that state-level forecasts are key, but that’s not necessarily the case. Fewer and fewer people respond to polls. In 1997, 90% of voters were contacted for the polls and 36% responded. In 2012, 36% were contacted and 9% responded [Link]. That’s right, 9%!! It’s getting hard to make the case that polls matter. Some no longer rely on opinion polls. Here’s a list of forecasting models with a description of the information they use. This list isn’t comprehensive–I’m doing the best I can with shrouded information surrounding some of these models. A variety of information from short-and long-term economic indicators, incumbency, charisma of the incumbant and challenger. Polls are not used. This model, however, can make predictions a year before the election (it predicted that Obama would be reelected). state polls, economic indicators, historic information about poll biases, post-convention bounce correction factors, etc. state polls (accounts for poll biases in a simple manner). state polls (I’m not sure if they account for poll biases), economic indicators (the president’s net approval-disapproval rating in June of the election year; the percent change in GDP from Q1 to Q2 of the election year; and whether the incumbent party has held the presidency for two or more terms) to contribute to a Bayesian “prior” for how the race will unfold. The methodology will be published in the Journal of the American Statistical Association (forthcoming). how close did Romney get to not being the Republican nominee? I will have a series of posts on elections and voting leading up to Election Day (hint: check back over the weekend!). This blog post is about the nuts and bolts of forecasting using polls and about interpreting the results. Many of the polls are a dead heat. Why doesn’t this mean that Obama has a 50-50 chance of being reelected? Let’s pretend, just to make the example really simple, that if Obama gets greater than 50% of the vote, he will win the election… [W]e want to know what is the “percent chance” Obama will win, taking into account what we know. So let’s run a bunch of “simulated elections” where on average Obama gets 50.5% of the vote, but there is variability because we don’t have the exact number. Since we have a bunch of polls and we averaged them, we can get an estimate for how variable the 50.5% number is… We can run 1,000 simulated elections… When I run the code, I get an Obama win 68% of the time (Obama gets greater than 50% of the vote). But if you run it again that number will vary a little, since we simulated elections. The interesting thing is that even though we only estimate that Obama leads by about 0.5%, he wins 68% of the simulated elections. The reason is that we are pretty confident in that number, with our standard deviation being so low (1%). But that doesn’t mean that Obama will win 68% of the vote in any of the elections! Silver cautions against confusing prediction with prophecy. “If the Giants lead the Redskins 24-21 in the fourth quarter, it’s a close game that either team could win. But it’s also not a “toss-up”: The Giants are favored. It’s the same principle here: Obama is ahead in the polling averages in states like Ohio that would suffice for him to win the Electoral College. Hence, he’s the favorite,” Silver said. This Huffington Post article by Simon Jackman of Stanford describes the process of moving from poll averages to forecasts. The entire article is worth a careful read–it’s written more at the level of a technical reader. He steps through the importance of polling biases, meaning that the polls collectively under- or over-estimate Obama support. He accounts for this by looking at data about historic bias, while counting more recent elections more than more distant elections. This makes sense, because recent elections with polls via land land, text, etc., likely have more insight. This gives him a probability distribution for the polling bias instead of a fixed value of 0. I adopt an approach that concedes that we simply don’t know with certainty what the error of the poll average will be; I use a (heavy-tailed) probability distribution to characterize my uncertainty over the error of the poll average. Analysis of the temporally discounted, historical data supplies information as to the shape and location of that distribution. … Our problem is that we don’t know what type of election we’ve got (at least not yet). We should buy some insurance when we move from poll averaging to talking about state-level predictions, with some uncertainty coming into our predictions via uncertainty over the bias of the poll average we might encounter this cycle. We see the effect of this in the table below, which shows that the polls that average out to Obama’s chance of winning different states varies from 11%-97%. 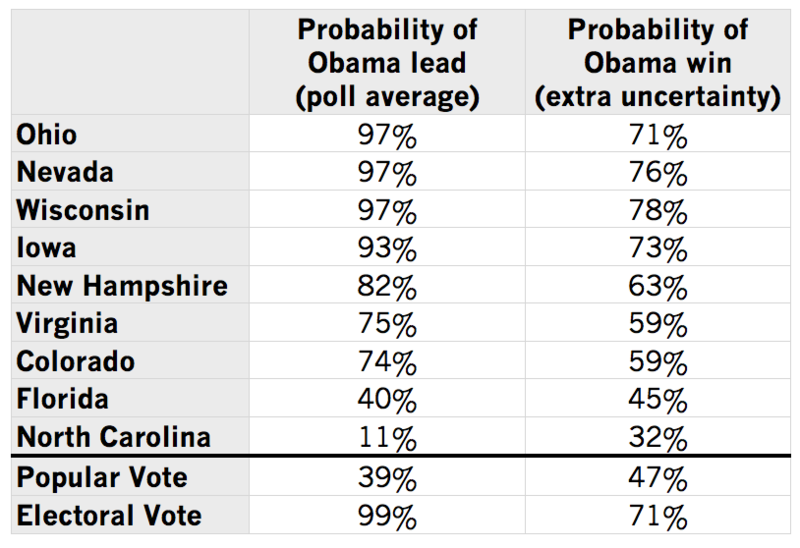 When the bias for the polling average is taken into account, Obama’s chances move closer to a 50-50 outcome. On a national level, this means that Obama’s chance of winning the election (“Electoral Vote”) lowers to 71% from an overly-optimistic 99% when bias is not properly accounted for. Andrew Gelman of the Statistical Modeling, Causal Inference, and Social Science blog writes a nice post in the NY Times about how the race is really too close to call. 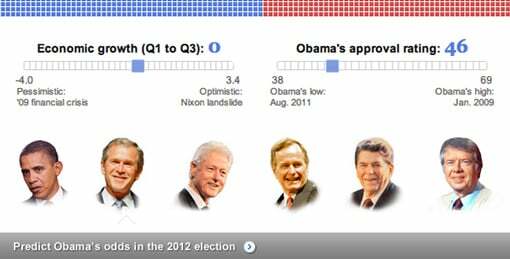 Nate Silver’s model, for example, shows that Obama has a 72% chance of winning. This means that we shouldn’t be too surprised if either Obama or Romney wins. The online betting service Intrade gives Obama a 62 percent chance of winning, and I respect this number too, as it reflects the opinions of people who are willing to put money on the line. The difference between 63 percent and 75 percent may sound like a lot, but it corresponds to something like a difference of half a percentage point in Obama’s forecast vote share. Put differently, a change in 0.5 percent in the forecast of Obama’s vote share corresponds to a change in a bit more than 10 percent in his probability of winning. Either way, the uncertainty is larger than the best guess at the vote margin. Let me be clear: I’m not averse to making a strong prediction, when this is warranted by the data. For example, in Feburary 2010, I wrote that “the Democrats are gonna get hammered” in the upcoming congressional elections, as indeed they were. My statement was based on [models that suggested] that the Republicans would win by 8 percentage points (54 percent to 46 percent). That’s the basis of an unambiguous forecast. 50.5 percent to 49.5 percent? Not so much. The voters are decided; small events could swing the election one way or another, and until we actually count the votes, we won’t know how far off the polls are. Over the past couple of weeks, each new poll has provided lots of excitement (thanks, Gallup) but essentially zero information. Not all election forecasting models rely on opinion polls. That will be the subject of another blog post. Stay tuned. how much is my vote worth to Obama and Romney? I live in Virginia, a hotly contested swing state. I don’t watch much TV, but when I do, there are back-to-back election commercials. I usually find 3 robo-call messages on my answering machine when I return home from work. My vote is valuable — and I know it. Amount spent on my vote = [Amount spend in RVA] / [Number of undecided voters in RVA]. Here RVA = Richmond, VA. The idea here is that the ads are not aired for the benefit of those who have already decided–they are for my “benefit.” To estimate both the numerator and the denominator, I use the following two formulas. The first assumes that advertising money is spent proportionally to the voting age population in different regions in Virginia. Amount spend in RVA = [Amount spend in Virginia] * [Potential RVA voters] / [Potential VA voters]. Number of undecided voters in RVA = [Potential RVA voters]*[Fraction who will vote] * [Fraction of undecided voters]. First, I looked at how much they spent on advertising in Virginia: $96M [link]. When I put this all together, I find that my vote is worth $250 – $545. The $250 figure assumes that the voter turnout is historically high (67% from the 2008 election) and that there are many undecided voters (they peaked at 9.2% on 8/1, about the time when the campaign ads started in full force). The $545 figure assumes a more reasonable voter turnout (60% from the 2004 election) and that there are fewer undecided voters (there are currently 4.7% undecideds). A more realistic scenario would be to include the 60% voter turnout with 6.0% undecided voters (the value before the conventions), yielding $427 for my vote. I’d rather pocket the cash. 11/5 UPDATE: $131M was spent on ads in Virginia, which means that $582 was spent for my vote with a range of $340-$744. This only counts ads, which means that this grossly underestimates how much was spent on me. If I scale this by the ration of the total amount spent ($1.6B) to the total amount spent on ads ($733M), then $1272 was spent on my vote with a range of $743 – $1624. This seems like too much. 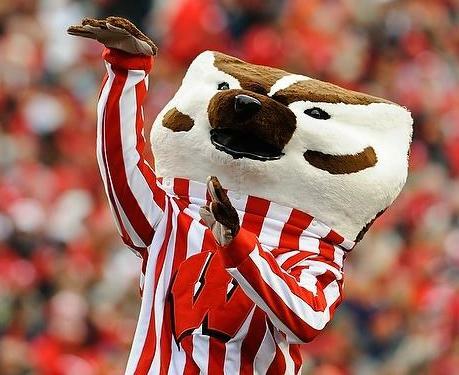 After the election excitement dies down, I’m ready to discuss campaign reform.